Home / contact hvac company / copper pie / laying / wrong directions / AC WRONG DIRECTION INSTALLATION ? AC WRONG DIRECTION INSTALLATION ? 1. the above pic has shown so many problems. 2. Copper pipe laying connects to outdoor, not in proper line. 3.Outdoor stand positions are up and downs(looking work quality is poor). 4. ODU units are placed in wrong directions. NOTE:- contact the authorized company for HVAC installation & services for better quality products, work & service. Mr Ashok garu u comment is good. 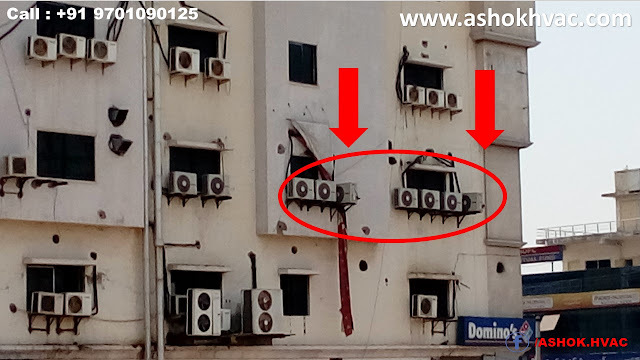 But what is perment solution of this building units. Mr Ashok garu ?? Mr. NAGABABU(nani) it's very simple. 1. extension the Outdoor unit stand for required sizes as per ODU dimenstions and minimum maintance gap. 2. Copper pipe laying run in the 63 or 73 mm dressing pipe for copper pipe saftey. any suggestions please mail us or comment in below. 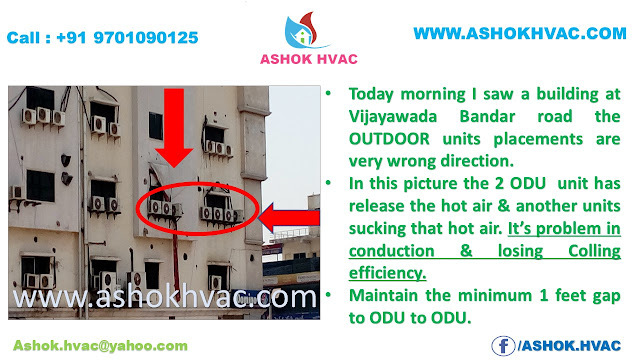 if you any doubts and Suggestions please mail to "ASHOK.HVAC@YAHOO.COM"
I might want to thank you for the endeavors you have made in composing this article. Click the Following Page I am trusting the same best work from you later on too..